I owe apologies to several people who have been expecting packages from me. I am backlogged in most aspects of my daily life due to …….. LIFE! Kids, job, dog, elderly mother and broken wrist all required extreme amounts of time and energy over the past 8 days. So, I’m hoping to get myself together again and fulfill my obligations. n So, if you’re expecting a package from me, please be patient a bit longer. It’ll get to you, I promise! 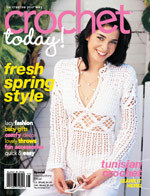 In other news – have you seen the latest edition of ‘Crochet Today!’ magazine? It has a lot of goodies in it, including a jacket I really want to make for my daughter. I like a lot of things about this magazine, but one of my favorites is that there is a chart of yarn substitutions – by brand name and weight – in the back of the mag. So, since the sweater jacket I want to make for my daughter calls for a yarn I’ve never seen – Aunt Lydia’s New Wave – the magazine makes it easy for me to substitute something in my stash or in the store. In this case, plain old RH Supersaver is included in the list of substitutes. I have plenty of that on hand, so I’ll be pulling out a couple of skeins of stashed yarn and starting on this cute jacket when my very tender wrist is stronger. I was able to crochet yesterday evening!! Got the cast off yesterday morning and crocheted 10 rows of a cute cap from the latest ‘Crochet World’ mag for my daughter’s roommate. Keyboarding is supposed to be good exercise for my wrist, but right now it just plain old hurts. So, I’ll sign off and get some rest.